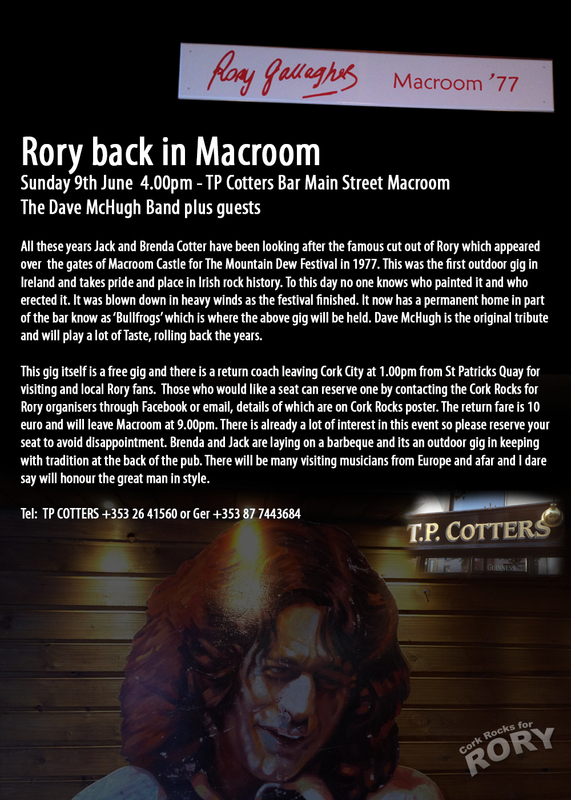 CORK ROCKS FOR RORY will take place as usual on 7th and 8th June 2013 in Cyprus Avenue with details to follow. For those of you flying to Ireland for this I want to bring your attention to an extra treat which will be held in Macroom on Sun 9th June. This will feature a full live set of Taste/Rory music in T.P.Cotters Bar on Main Street where the famous cut out of Rory from the Mountain Dew Festival in 1977 has been stored. The cut out is now on permanent display in a section of the pub that will soon be officially named Bullfrog’s. For those fans who would like to attend we will provide return transport by coach from Cork City to Rory’s second home. It will be a late afternoon free gig about 4.00pm. Brenda and Jack Cotter will have a bar-b-que etc so all in all should be a fun day. Coaches will arrive in Macroom early afternoon so time to stroll around and take in where Rory played the 1st big outdoor festival in Ireland. More details will follow and this notice is primarily for those who book flights early.